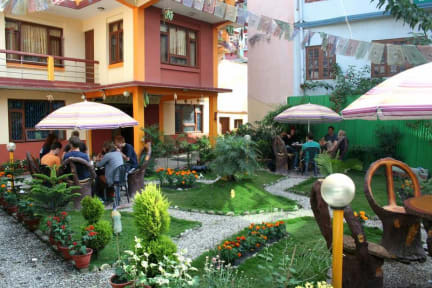 Elbrus home is an absolutely lovely place to stay in Kathmandu. Its high rating is well earned. Our group consisted of three women travelers. We booked a triple room and ended up right on a balcony. The rooms back from the road may pick up less road noise, but that didn't bother us. Good, hot showers after a week of not having them were a welcome luxury. Khem at the front desk was the most welcoming person, arranging tours that made the most of our short two day stay. I would easily stay again. Loved this place, staff were friendly and helpful, breakfast was great, very clean, great location, best place to stay in Kathmandu. 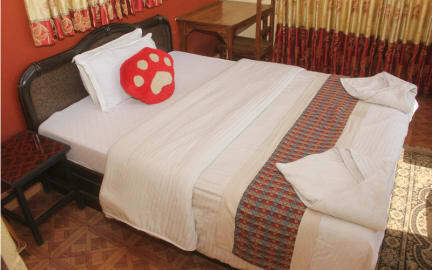 Very friendly accommodating staff, rooms are very clean and comfortable, liked the location as it gets you out of thamel. Had a great experience staying here, so much so booked another night for my last night in Kathmandu when I get back from my trek. Khem is extremely helpful and friendly and made my visit to Nepal much easier with his enthusiasm and assistance. The hostel is clean and comfortable and the garden beautiful. Perfect location. I originally booked this hostel for the first couple days, and then renewed my booking twice more after staying here. Great place, lovely comfy beds, really helpful staff and fantastic breakfast!